Howie, my first pet. A gift from Grandma Lolly just before she died when I was only a year old. 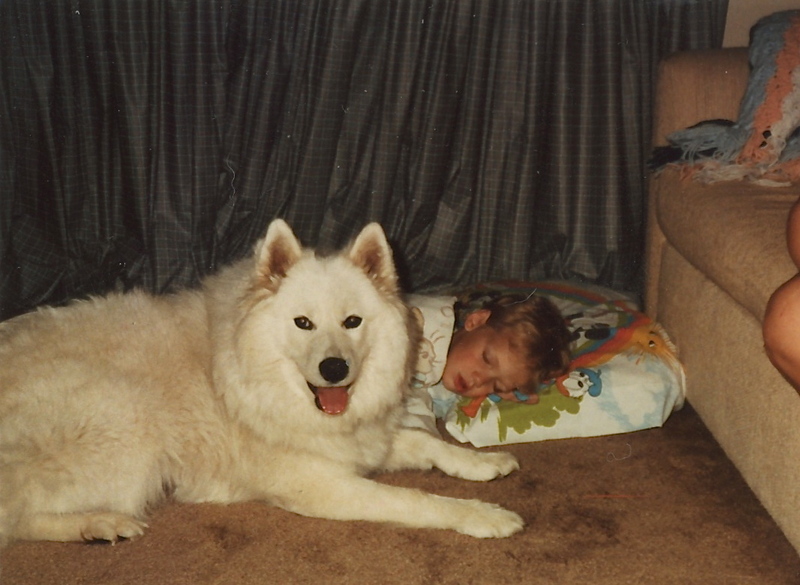 The author of the Fearfuldogs blog recently published a post titled “The Way We Were” featuring some photos of childhood pets that she’d found while scanning family photos. And over the past few months, largely in anticipation of the birth of my brother’s first baby, I’ve been doing the same thing. 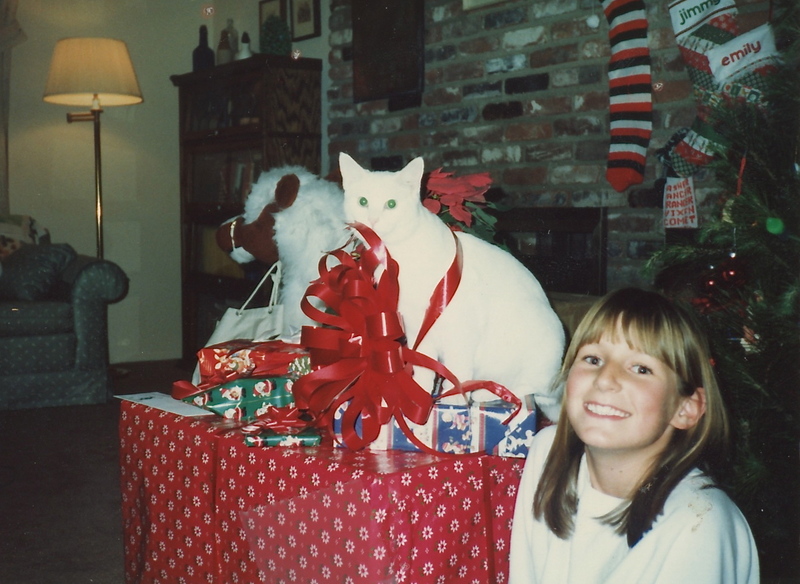 Digging through old photo albums and boxes, and slowly sorting and scanning our old family photos. I do not remember a time in my life when we did not have at least one, if not three or four, animals living in our house. Other than an assortment of fish, our menagerie was limited to just cats and dogs. 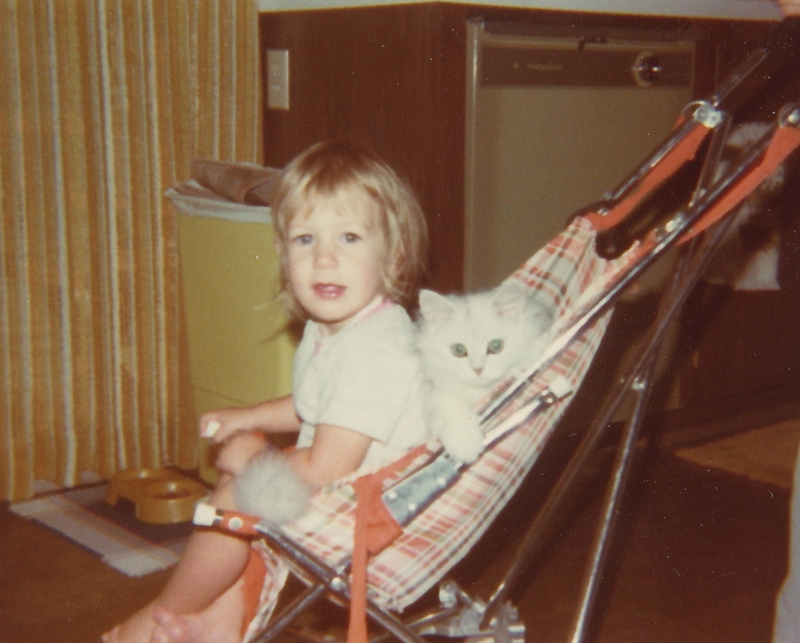 We had cat-clawed couch corners, pee-stained cement, a grungy shovel for chucking dog poop over the back fence into the ravine, an under-used dog brush, insufficient fencing and the occasional tick in the house and on us. And of course lots of fur on everything. Nellie guarding Jimmy while he sleeps. We had pets from the local pound, pets with “papers,” pets given as gifts, and pets who came home without parental consent. We had overweight dogs whose diet was supplemented by Wheat Thins from my dad and whatever my brother and I dropped on the floor. We had cats who fought with other cats and local wildlife in the area, sometimes winning, sometimes not. We had dogs who were off-leash pretty much all the time, and dogs whose sense of adventure routinely overwhelmed my father’s fence-building skills. Nellie and Max doing rewards-based training . . . without the training part. Our dogs rarely wore collars, were left in our backyard when we weren’t home, and frequently ran out into the middle of our street to say hello to someone jogging past our house, whether the greeting was welcome or not. We did not have disposable income. Two of our dogs we gave back. By today’s nearly unattainable rescue group standards, I’m guessing we would’ve ranked rather low on the potential adopter scale. Were our parents bad people? Negligent pet owners? People completely devoid of compassion for our animals and a sense of responsibility? Nope, quite the opposite. Max was a puppy given to my brother as a birthday gift. They were best buds. Our cats and dogs were family. They slept in our rooms and our beds. They went on vacation with us. They hung out with our friends and family. And they’re a constant presence in most of our photos and all of our memories. We mourned when they died, and we went to the vet as a family when a pet needed to be euthanized. My parents taught us respect for animals, not just ours, but any animal. We were expected to help care for our pets because that was part of being a responsible member of our household, and because it was the least we could do for all the joy they brought us. We made lots of mistakes. Many to the detriment of our pets’ health and longevity, no doubt. Me and Gremlin. He was a birthday gift to me and frequently attacked me. And so where are we today? I advocate for humane education and animal welfare and care for five rescued animals, and my brother completes weekly training in dog behavior and nosework as a Sherrif’s Deputy and is partnered with a lovable drug-sniffing pooch named Guerra. Several years ago, my mom willingly took in an emaciated cat I found living under a car in our neighborhood, and now she helps a good friend care for her lovable and very high-maintenance “pit bull” dog. 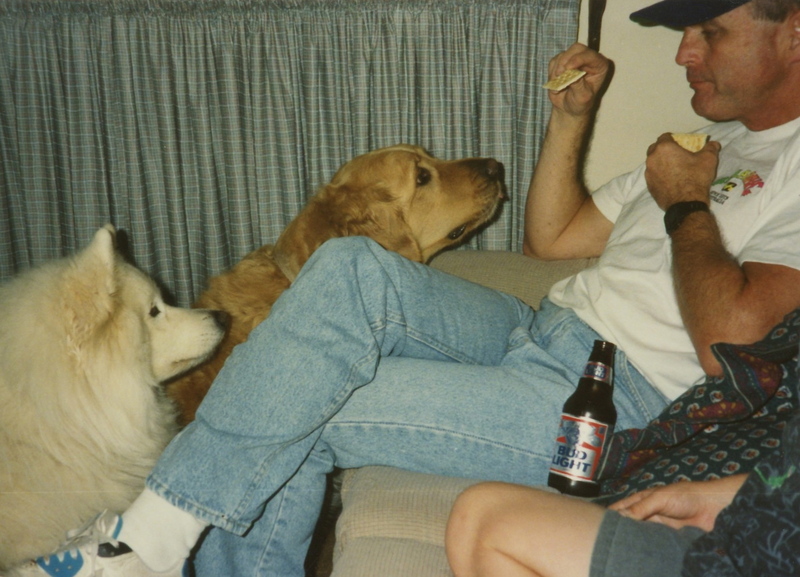 When we still lived in Los Angeles and had just two dogs, my dad would drive over to our place, oftentimes in heavy traffic, to let our dogs out and play ball with them while my husband and I were at work. And now he feeds turkey bacon to his own dog, who is smaller than most of our cats were, and carefully guards her while outside should a coyote or hawk attempt to run off with her. When we first brought Jake home, he’d burrow into Max’s fur like a tick. Would all this be the case had we not grown up with all those less-than-ideally cared for pets? My guess is no. 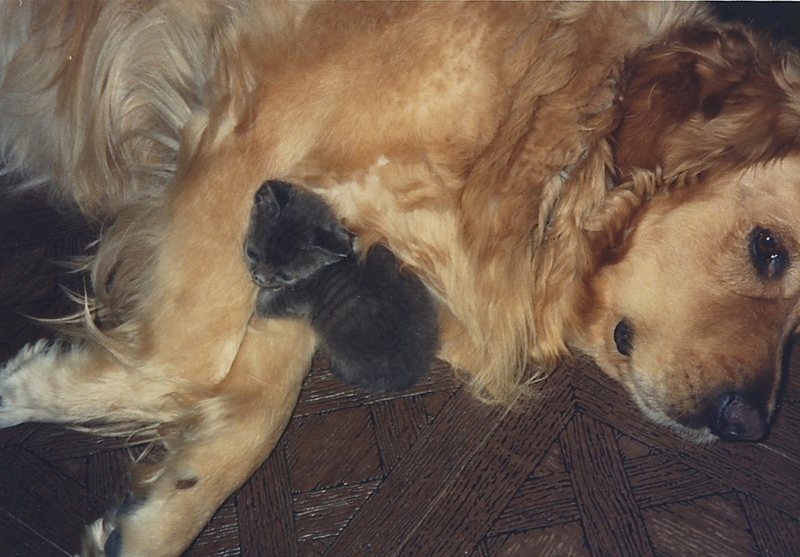 Over the next few weeks, I’ll be posting some more old photos and writing about specific pets, including the bumbling and affable Golden Retriever who we lost for six months and then found, and the fighting cat with the hole in his head. This entry was posted in Animal Welfare, Fun Stuff, Uncategorized and tagged animal histories, animal welfare, cats, childhood memories, childhood pets, dogs, family photos, kids and pets, personal history, pet adoption, pet ownership, pets, responsible pet ownership, self reflection. Bookmark the permalink. Enjoyed your post and the pictures! 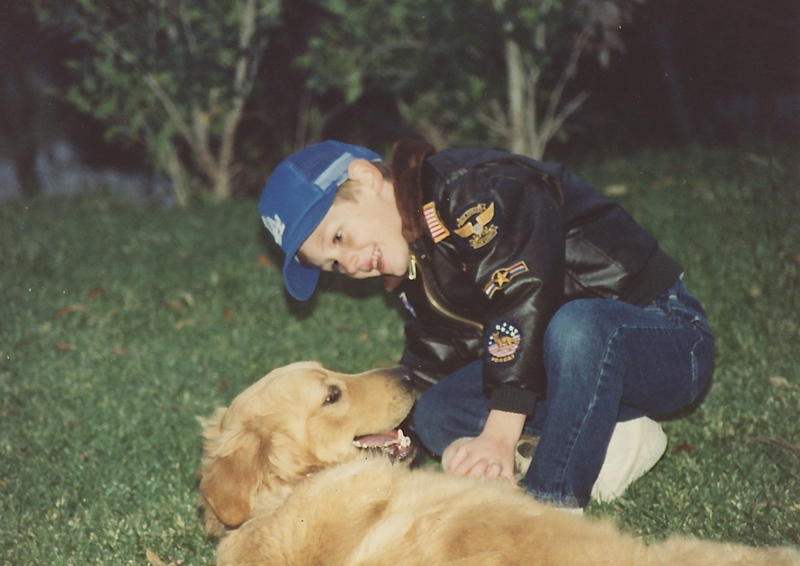 I, too, was fortunate enough to have a childhood filled with pets. I feel sorry for kids who do not have pets in their lives. Our pets taught me compassion, responsibility, and true unconditional love and brought much joy to my life. Beautiful stories and pictures, and by way, sometimes it seems like Piper the pretty pit loves your mom more than me. She loves her auntie Kay!!! !